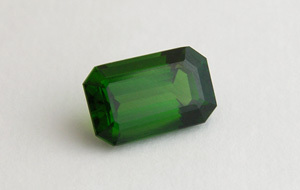 Some sources suggest the ‘chrome-tourmaline’ actually represents the mineral chromium-dravite. Original description: ‘Хромдравит’ Румянцева, Е. В. [Rumуantseva, E. V.], 1983. Хромдравит — новый минерал из Карелии [Chromdravite — a new mineral from Karelia] — Записки Всесоюзного минералогического общества [Zapiski Vsesoyuznogo Mineralogicheskogo Obshchestva] 112 (2): 222—226 [view in ‘Library’]. Type locality: Velikaya Guba uran-vanadium deposit, Zaonezhie Peninsula, Lake Onega, Karelia Republic, Northwestern Federal District, Russia. Type material: Mining Institute, Saint Petersburg, Russia, 1239/1; Fersman Mineralogical Museum, Moscow, Russia, 82811 (Anthony et al., 2001—2005). Etymology: for chromium in the composition and similarity to dravite. Distribution: known from East Africa. Essential elements: hydrogen (H), boron (B), oxygen (O), sodium (Na), magnesium (Mg), silicon (Si), chromium (Cr). Crystallography: trigonal — ditrigonal pyramidal. Crystal habit: long crystals with triangular cross section and rounded sides; definite striation parallel to main axis. Cleavage: no data. Fracture: no data. Tenacity: brittle. Hardness: 7—7.5 (Lazzarelli, 2012). Density: 2.85—3.35 g/cm3 (Lazzarelli, 2012). Luminescence: none. Colour: emerald green. Diaphaneity: transparent to opaque. Lustre: vitreous. Refractive index: 1.614—1.666 — anisotropic [uniaxial (-)] (Lazzarelli, 2012). Birefringence: 0.014—0.04. Dispersion: no data. Pleochroism: strong; dark green to yellow-green. 2 specimens: 0559 — 0.16 ct, Tanzania; 0525 — 1.12 ct, no precise locality [East Africa].